Yolanta Skura, the founder of the CD label Op. 111, is a deceptive woman. But what might be an insult in other circumstances becomes a tribute to her quiet but firm powers of organization and persuasion. There was talk, when I was first asked to interview her, of Op. 111 whisking me off to a recording session in a Medici palace in the north of Italy. I had heard – not without envy – of writers enjoying similar junketings before: one friend of mine was jetted off to St. Petersburg for CD Review, and other Fanfare correspondents get shipped to villages in the Swiss Alps for things like the birthday celebrations of Claves and other such jollities – and so far all I had managed was an afternoon in Nantes, straight in and as quickly out again by high-speed train. But now I had a seat on the locomotive I had conveted, the gravy-train: a few days in marbled Baroque splendor would do very nicely, thank you. But – and here's where the quiet persuasioncomes in – before I had cottoned on to what was happening, I had agreed to come down to Op. 111's headquarters in a nondescript street deep in the Fifteen Arrondissement of Paris, and so exotic that it's only seven stops on the Métro from where I live. And all done with such enthusiasm for the coming interview that I didn't even notice that my three days' hoped-for wallowing in Frescobaldi motets had bit the time-honored dust. Then some "extra information" – "Percentage of sales to export France: 32% - export: 68%" and a list of last year's awards – and "my" interview, questions and answers sealed, if not signed, and delivered. By now I was expecting to meet some super-efficient dragon of a woman, used to having her own way. Early one evening I ring the doorbell of 37 rue Blomet, prepared to be friendly but firm. As soon as I am in the hallway, an attractive, gentle-featured and soft-spoken woman introduces herself as Yolanta and receives me with obvious warmth. I am introduced to Victoria, whom I have chatted to on the 'phone, and other members of staff whom I haven't yet encountered, and Yolanta disarmingly suggests that "it's a shame you couldn't make it earlier – you could have met the other people in the team". A bottle of champagne appears and we all toast one another's well-being. I am led down to the store-room and my arms piled high with compact discs – mediaeval chant, Russian chant, Bach, Chopin, Mendelssohn, Brahms, Gottschalk, and more. My initial imaginings were being confounded, one by one. And by the time we sat down to talk, my hackles were down and my tail was wagging. Yolanta Skura's faxed version of our interview began with the founding of Op. 111 in 1990. I thought I would go back a little further. There was just a tiny hint of a foreign accent in her French; so where was she from originally? "I am Polish, born and bred, from Katowice originally, although I studied at the Conservatoire of Warsaw. I was a pianist and gained a premier prix. But I had a severe accident to my hand when I was sixteen and had to train as something else. So I took a course as a Tonmeister and came to France as a trainee, for three months to begin with. Then I had to earn my living, so I wrote to several companies offering my services as a producer and I was taken on by Erato. I was lucky enough to work with some outstanding musicians, people like Maurice André, Marie-Claire Alain, even John Eliot Gardiner at the beginning of his career. At the beginning I was learning with every job I undertook. You have to earn the confidence of the musicians you work with, which means that you have to help them achieve the aims they have in mind. And when you see the career that someone like Gardiner has had since then, you feel pleased to have been in on it at the start. "Then after Erato I spent several years as an independent producer before setting up Op. 111." Now that we have reached our starting point, next question: why the name? Why not K. 491, or BWV.565? "It's a name that is easy to recognize, it's international – and it symbolizes high quality. And we've always been an international label. My aim from the start was to base the label on young musicians with whom I was acquainted and to move with them, to follow their development. The major labels seem only interested in taking the major names and doing the standard repertoire with them, or in finding some Wunderkind that they then have race through a stack of music before they are ready for it. What we did was take musicians in whom we had confidence, who were unknown just a few years ago but now have world-wide reputations. But not just choosing them any old how: you have to watch them over the years, follow their careers, keep an eye on their development – and then be prepared to trust them." Including allowing them to work for other labels? The reason for my question is that I notice the name of Rinaldo Alessandrini prominent in the Op. 111 catalogue, and yet when not so long back I interviewed José Carlos Cabello of the Spanish label Glossa for Fanfare (18:2), he was looking forward to the series of recordings of Spanish organ music that Alessandrini was going to do for him. "Yes, was going to do." But is it just a question of being proprietorial? "No, no, it's not that at all. I think it's essential that when what you're trying to do is communicate something, you should not create confusion in people's minds. Apart from the fact that you have to build up a relationship of trust between the artist and his label (which includes the question of respect for the work of all the team here at Op. 111), there's a purely practical aspect: when you're selling discs all over the world, the customer has to be able to rely on the fact that such-and-such a name appears on such-and-such a label." And what of recording technique? Victoria had previously sent me a clutch of Op. 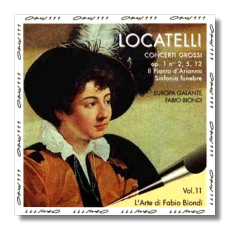 111's newest releases, including a disc of concerti grossi by Locatelli (with Fabio Biondi and Europa Galante on OPS 30-104) and another of "Villanelle, Moresche e altre cazoni" by Lassus (Alessandrini and his Concerto Italiano on OPS 30-94). Doing my advance listening before the interview, I had been struck by the immediacy and richness of the recorded tone. There is a trend towards more simplicity: these days everyone seems to be down to two mikes and no mixing; does Yolanta have a similar approach. "I don't have any recording 'philosophy' as such. I do try to keep things as simple as possible, but I don't insist on any particular technique or formation. You have to be flexible: I like simplicity, but if something doesn't get you the results you want, you have to be prepared to drop it and try something else. It's like being a surgeon: you can't open up someone's stomach and just proceed by the book – you have to be prepared to take quick decisions, since there's no time to spare. You can't spend a day juggling with mikes. If you do use multi-microphones, though, you have to take care to make sure that the sound is as pure as possible, and as close as it can be to the sound you would hear in a concert. You should never be aware of the microphone technique itself." But she also pays attention to "authentic" details in such things as recording venue, such as this Palazzo Medici outside Milan (which, it seems, I won't be seeing after all) for her sixteenth- and seventeenth-century Italian repertoire? "Of course. And a marble-lined hall like that gives a marvelous sense of occasion to a recording, though again you have to be careful: marble can also make for quite a confused sound." In all this, there's a question that has been bothering me: if Yolanta grew into her job with big musical names who are now moving into an older generation and who are known for more or less standard repertoire, how come this accent chez Op. 111 on early music? "I don't put the accent on any kind of music. The performance of music evolves, there's a permanent development of interpretative technique – and I am trying to follow that development." I try to get her to admit that there is nonetheless a preponderance of early music in her catalogue. "No! We have plenty of late Romantic music in our catalogue. We have an orchestra in Cologne, the Neues Orchester under Christoph Spering, which records music from the nineteenth century for us. We have works by Maurice Ohana that were composed only three or four years ago. And it's not simply a question of pursuing the unknown, either. What is interesting, instead, is that you can set standards of interpretation for other artists. Three or four years ago, for example, Fabio Biondi recorded The Four Seasons for us – hardly the least well known repertoire in the book. But it has changed the way musicians look at the music. You must always aim higher than you think you might achieve – that's how you make progress." Op. 111 has been lucky in its timing, too. A quarter of a century back, when Yolanta Skura was learning her trade under the wings of Erato (though, all flattery apart, she barely looks old enough), most of the running in early music was being made in England. Now there are Italian, French, German and many other approaches to the performance of early music, so that she has a much richer field to choose from. "Yes, it's marvelous, and it also means that the discs themselves have a much more receptive public. In Belgium and Holland, for example, people respond to our discs with enormous enthusiasm. And paradoxically, our most difficult market is Germany, where people are generally educated in music and where they learn to play themselves. That education gives them a certain view of music which means they may not always be open to new or unexpected ideas. But the extraordinary growth of early-music groups is very healthy: there's a vast amount to be learned from the differences between the Consort of Musicke, the Concerto Italiano, between all these English, Dutch and other groups." And has the USA been a fruitful market? "The trouble is that there's no centralization. Our distributor, Harmonia Mundi in Los Angeles, has to tackle the market state by state. And it's such a large place that it's difficult for the musicians to make themselves known." That emphasis on the musicians themselves strikes me as paradoxical from a long-time producer of recorded sound: is the living presence of the musicians really that important these days, when the CD can bring them into anybody's living room? "Yes, it's very important. The disc itself isn't an event; it's the concert that's the event. The disc is a sort of visiting card which allows you to communicate the importance of the individual musician. It's the artist himself who produces the excitement." But doesn't the disc allow the musician to travel further, by bringing him or her to the attention of, say, festival managers and people of that order (never mind the individual listener)? "#There are just too many discs, too many people trying to get the attention of festival directors and others in similar positions. I get hundreds of discs here, for example, from musicians who want me to record them." And she just slings them out? A half-grin appears on her lips: "You can't listen to them all, there isn't time: you have to be selective." Op. 111 has a fairly adventurous catalogue, which suggests that some active exploration has been going on. So what corners of the repertoire would she like her label to turn to now? "This is not a repertoire-led label. Definitely not. I am not interested in attacking the repertoire. I am looking for individuals with something to say and whom I can accompany through the repertoire. The repertoire itself comes second. It has to be an artist who comes with an attractive idea; if he presents it well enough, I'll agree." Then, since some of that repertoire – her discs of mediaeval Russian plainchant, Byzantine chant, Yiddish songs – are beginning to stray out of the area that can be defined as "western classical music", can one imagine that if, I dunno, some Romanian woman came along and proved to be an inspiring singer of doina, she might stand a chance of being taken into the Op. 111 fold? Supposing that, to take a Polish example from not far from her origins, Yolanta came across a folk fiddler like the Góral highlander Bartek Obrochta who so impressed Szymanowski in the 1920s, would her catalogue stretch far enough to take in such non-mainstream musics? "#First, because the image of the label has to be coherent. And second, because I have to be able to guide and help the artist, and I can't do that if the music is too far from my own range of experience; I won't have the feeling of complicity with the artist that I think is necessary for a producer. When Walter Legge was producing an opera, for example, he would rehearse all the singers himself, at the piano." But she's less of an autocrat, I hope. Another half-smile. "Well, I do like to be rigorous. And I like my work to be well organized. But it's also this question of aiming higher than your 'limit'. And my artists are responsible people who are capable of aiming higher than the current models." What of her catalogue "practice", if that is the right expression? Does she intend to keep all her recordings available, as Robert von Bahr of BIS has pledged, or would she let slow sellers quietly drift out of stock? "Well, so far the question hasn't arisen, fortunately: my discs are all selling well." And new media: does the advent of the electronic age, with the likelihood of people dialling up music through their computer screens, hold no terrors for a producer of such a tradition-bound good as classical music. "The act of creativity will remain the same, no matter what means you use to disseminate it, whether it goes out in disc form, by fibre-optic cable, or whatever else. The format itself isn't important. And all the elements of our discs – the music itself, the cover illustrations, the artists' photographs, the texts, everthing – are stocked in digitized format on CD-ROM. Everyone on the staff has a computer. We have already produced a catalogue on CD-ROM, with music, images, text, etc. So we can turn to selling in electronic forms, whenever that happens, with relative ease. When it comes to the future, I am an optimist." As, indeed, am I, a staunch libertarian who just happens to have spent the previous day at a conference on the likely implications of the Internet, or whatever it becomes. And so I begin to explain to Yolanta my conviction that the development of markets on the "information superhighway" will produce the biggest quantum shift in economic behavior since well before the invention of soft toilet paper. The Internet is, apparently, news to her and she begins to show lively interest. Indeed, within seconds the tables have turned and I realise that she is now interviewing me, with pointed, technical, practical questions on how it all will work, how to make the information available, how potential consumers will find it, how will sales be possible…. Here is someone who has, only a few minutes before, proudly given me a disc of twelfth-century chant by female mystics in Compostela now savoring more or less instantly the opportunities of an idea so huge that many other people, coming to it new, barely take it in And yet already Yolanta is busily imagining how she will be able to turn the system to her advantage – impressive confirmation not only of her own intellectual capacities but also of the motto that sits below the company name on the letterhead: "Excellence with vision". She said it.